At ATA Family Martial Arts, we want to give kids of all ages the opportunity to learn effective skills and gain more confidence. Our Karate Kids program is designed for students ages 7 to 12, and it’s a great option for those who have participated in our Tiny Tigers program, as well as those who are starting their martial arts training. Since the Karate Kids program is intended for ages 7 through 12, the focus is placed on helping them develop traditional martial arts skills, as well as respect for those around them and discipline in every aspect of life. Children of this age are capable of greater physical and mental conditioning, and we will begin with basic self-defense training, along with sparring and weapons training. We always make sure that each lesson is age-appropriate, and we work hard to ensure that each student understands the reasons behind our methods. We group students of similar ages and abilities together so that no one feels overwhelmed. 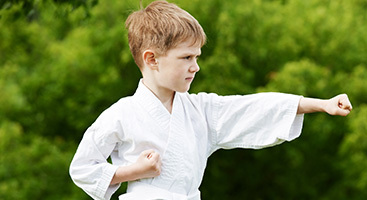 If you have a child who is interested in signing up for a karate or martial arts class, then it’s good to talk to them about how our classes can boost their self-confidence and self-esteem, but that each class will also present unique challenges. We combine bully prevention training and school and home integration, stressing the importance of how and when to use what they’ve learned, if that time ever comes. Above all, we want each student to understand that they are being trained to become leaders, and that their skills are intended to help them become stronger physically and mentally, not so that they can use them whenever they want. If you’re interested in registering your child for our Karate Kids program, then please contact us today. You can use the form below, or you can call the location nearest to you. We have martial arts studios in Aurora and Centennial, CO, as well as Forney, TX.